From beyond the grave and into your nightmares comes the Evil Entity! 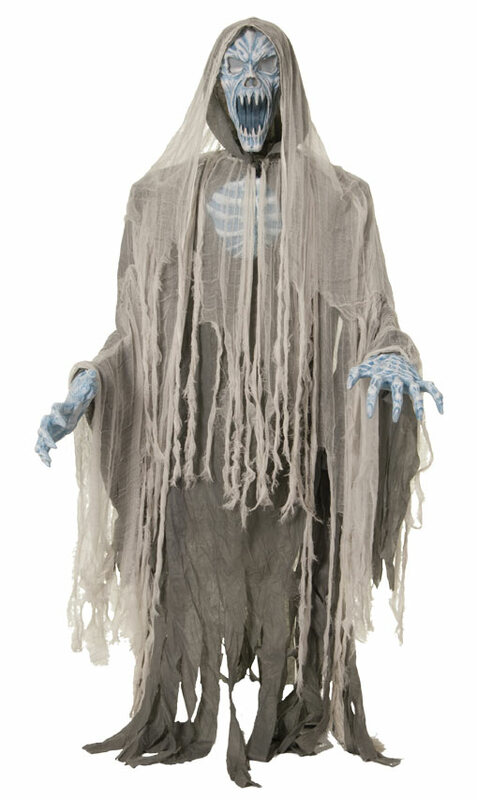 Draped in hooded flowing ghostly fabrics, the 5'10" (70 inch) tall Evil Entity has a light-up plastic head and chest with matching plastic hands. Plug the UL transformer plug into any standard outlet to operate the lights, the motion sensor and the 2 rotating sounds, and for him to slowly rise up and down and sway from side-to-side as though he is floating and swaying in the wind. The sensor is sound sensitive and the Evil Entity will say one of two sayings with each activation of the sensor "Come to me-you cannot hide from me-your soul is mine!" and "I will find you-don't look back-leave!" as his head and chest light up with a bluish ghostly glow. Assembly required. Love the sound, love lights, love the motion. I made a stand I have it lifted 5 feet off the ground looks like it is floating over my cemetery. The sound is great. The motion looks as if it is floating. A little fog and the right lighting it is a wonderful product. Order was delivered quickly, it was easy to assemble and works like advertised. I'm very pleased.